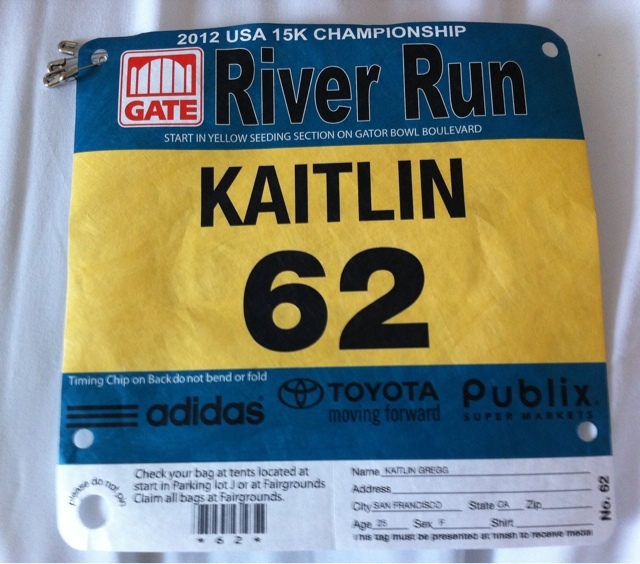 I'm sitting here in my hotel room in Jacksonville, Florida, preparing for tomorrow's 15k at the Gate River Run. This will be my first attempt at this distance, and I'm not gonna lie, I'm pretty excited about it! :-) In between a 10k and a half marathon, I think the 9.3 mile race distance just might be my ideal race length. I've been told that my funky-looking stride lends itself well to longer races, so here's to hoping that 15k is a great distance for me! Opportunities to test myself at this race distance are few and far between, so I'm planning to put it all out on the line tomorrow and get after it. My NBSV teammates Catha and Kate will also on racing, and together we'll be competing for the team title. The race coordinators have put together a fantastic field, so competition will be stiff, but the three of us have been training really well and I'm excited to see what we can do. Speaking of which, if you'd like to watch the race, tune in to Runnerspace tomorrow morning at 5:15 AM Pacific - the gun goes off back here in Florida at 8:24 AM Eastern. Best of luck to all those racing this weekend at NCAA Indoor Nationals (go little bro Brendan in the 5k! ), World Indoors in Turkey, and early season track meets all over. And as always, thanks to all for your love and support!